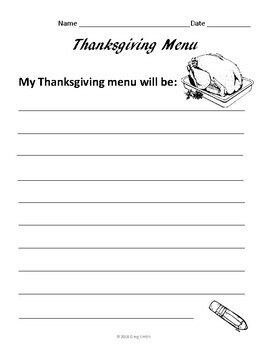 This Thanksgiving menu math project is a great activity to do right before the Thanksgiving holiday. Have your students plan a dinner for a family of four to teach them the value of money. 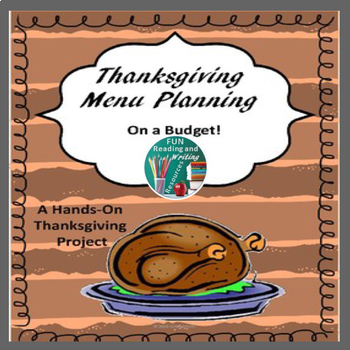 In this Thanksgiving dinner menu planning and grocery shopping project they will have (imaginary) $50 to spend for food . They should include a turkey weighing between ten and twenty pounds, dressing, potatoes, salad, and dessert, along with any extras they can afford. Students should try to stay within their budget. Includes teacher directions, student instruction sheet, menu sheet, food price recording sheets, and a reflection sheet. Students can then do a brief oral presentation to share with the class. 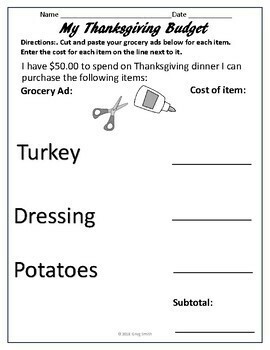 Ask each student to bring in grocery ads from newspapers and flyers, or you can provide them yourself from your local grocery stores. Pass out the instruction sheet, the menu sheet, and the papers for recording the cost of food. Have each student write out a menu. 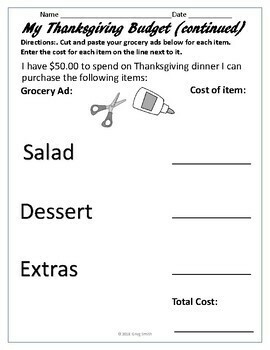 Then they cut and paste pictures of the food from grocery ads for each required food item and enter the cost on the two project sheets. At the bottom of the second page, they should total the cost of all their groceries, and see how much is left or if they went over their budget. You may have students give a brief oral report afterwards about their Thanksgiving shopping, and if $50.00 is enough to feed a family of four a Thanksgiving meal. ©2018 Greg Smith - Fun Reading and Writing Resources. This material is protected under the Digital Millennium Copyright Act. For classroom and homeschool use.